Brisbane - The Proteas will be looking for early wickets on day four to give them the best possible chance of victory in the first Test match against Australia here at the Gabba. "Tomorrow morning is a key period of the game," said centurion Jacques Kallis. "If we can nip out a few tomorrow morning and put some pressure on Australia, who knows." Dale Steyn and Morné Morkel accounted for the three Australian wickets that fell in the final session on Sunday, with one and two wickets respectively. "We have to give ourselves the opportunity, the game is far from dead and there is enough in the wicket as well. "As long as we keep applying the pressure, it is all that we can do, if Australia plays well then fair enough but we have to get the ball in the right areas." Kallis earlier added another Test century to the 43 behind his name, as the Proteas posted a commanding total of 450 all out. Hashim Amla was the other star performer with the bat, scoring his third century in consecutive matches against Australia, and passing Michael Clarke as the leading run-scorer in this calendar year. This was Kallis's highest Test score against Australia, and his fourth century of the year; the most by any batsman in 2012. 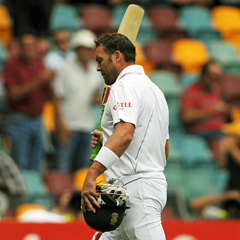 "I think I have been playing really well for the last couple of years," Kallis commented on his personal form. "I have been scoring at a decent rate and I feel like I'm getting into good positions which is key to batting. Hopefully I can carry on with that, you need a little bit of luck to go with it as well, so may that continue." The injury to JP Duminy puts added pressure on the seam attack, however Kallis insisted the wicket can be of assistance if the bowlers are disciplined. "It has quickened up a little bit but I think it is a good Test wicket. "There is a little bit in it for the fast bowlers when they get the ball in the right area and there is some decent carry as well."